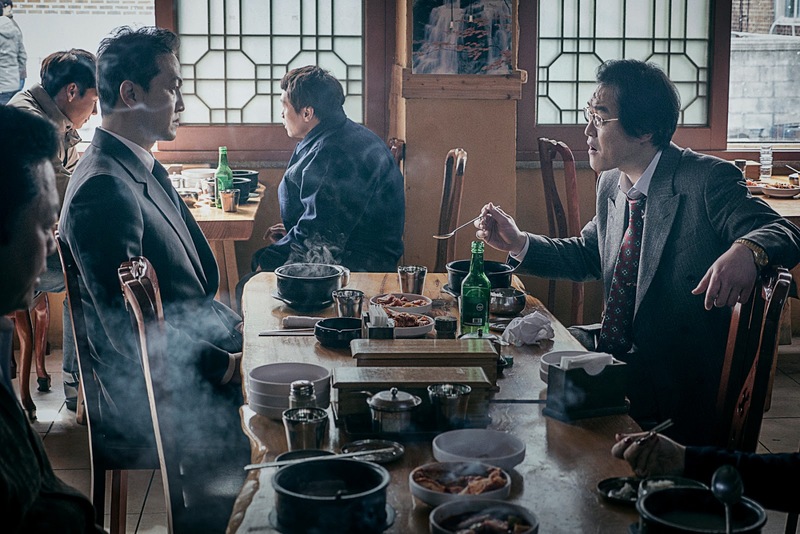 The run of corruption thrillers that have proven so popular at the Korean box office of late shows no signs of abating with The Prison, which takes the same themes that have populated works such as Inside Men and Veteran, and applies them to the more intimate setting of a jail, which serves as a stand-in for society at large. In this debut work by new director Na Hyun, a former cop winds up on the wrong side of the law and is handed a jail sentence. In prison, he soon finds his way into the entourage of a criminal mastermind who controls everyone within the walls, even the guards and the warden, routinely sending convicts outside on missions. Convicts stepping out for brief missions is hardly a new twist on the prison film, following France's A Prophet and the Filipino hitman thriller On the Job, but unlike those grounded and gritty works, the setup in The Prison beggars belief early on. In its determination to make its antagonist an almost mythical crime mastermind, director Na has created a world with tenuous links to reality. Further complicating matters are several small hints placing the narrative in the late 90s, such as the old beer and soju bottles that occasionally appear, for no obvious reason. For the viewers who do notice the film's hidden period setting, it may only create a further distancing effect in a story that neither takes flights as a stylized genre film or remains grounded enough for effective social commentary. Once the players have been established on the board, the various pieces move in their expected patterns, with predictable double-crosses and hidden agendas leading us to what is supposed to be a bombastic climax but really comes off as desperate (and illogical) attempt to lift what has until then been a lukewarm tale of brooding machismo in a system gone wrong. Late 90s superstar Han Suk-kyu (Christmas in August, Green Fish) has gravitated towards several morally ambiguous if not downright evil characters in his latter career and the change mostly agrees with him. Playing the big boss here he makes a valiant attempt to bottle up rage and power in a calm exterior that demands respect, but whether it is control or the script, the tone is too rigid with a resulting character that falls apart in the end stages of the narrative. Kim Rae-won of Gangnam Blues brings along his best swagger as the former cop, but he's little more than a caricature that follows an increasingly predictable path. Lee Kyoung-young and Kim Sung-kyun fare better in supporting parts, but they play strictly within their comfort zones. 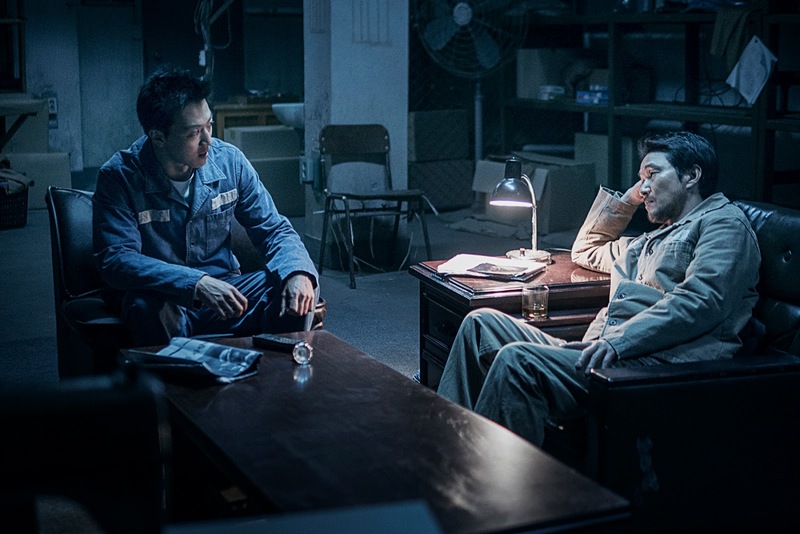 Tech specs are solid, particularly from cinematographer Hong Jae-sik (Han Gong-ju, The Piper) and Lee Nae-gyoung (Way Back Home) who lend the jail more character than the script does to its cast. 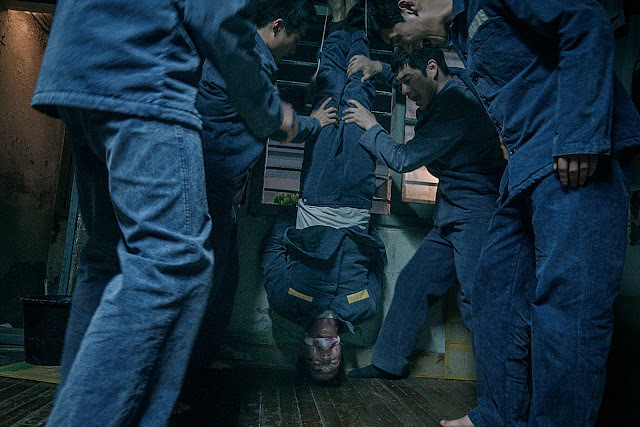 The Prison marks the second jail-set hit in as many years for Korean studio Showbox (which handles under a dozen titles per year) though it is unlikely to scale the same heights as A Violent Prosecutor. While Showbox won't be hurting financially with their latest title rival CJ Entertainment may be fretting due to their own upcoming prison thriller The Merciless, which also features a cop who winds up in jail and under the wing of the top dog on the inside whose criminal operations stretch beyond prison walls. To keep up with the best in Korean film check out MKC's reviews and features, like us on Facebook, and follow us on Twitter.